Calculation of the first market movement (from levels 0 to 100). 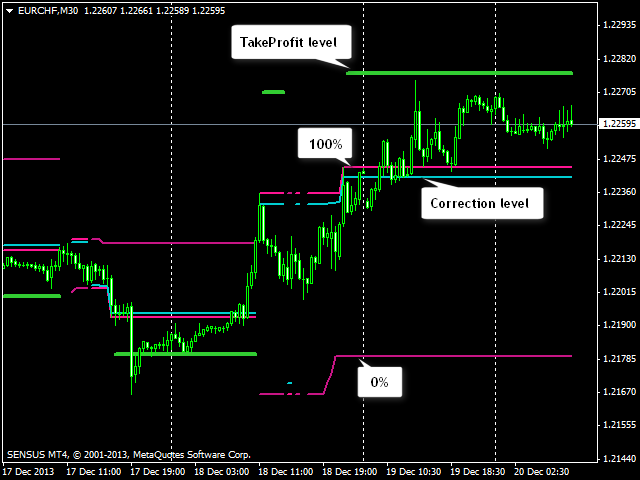 Displaying possible price movement from 100 and higher to Profit Level, as well as in the opposite direction to Correction level and Revers level depending on the direction. The indicator is not redrawn! CorrectLvl - correction level. When reached, level 100 is drawn (the market has performed its first movement). The recommended value is 0.055. Profitlvl - auxiliary level of exiting the market with profit. 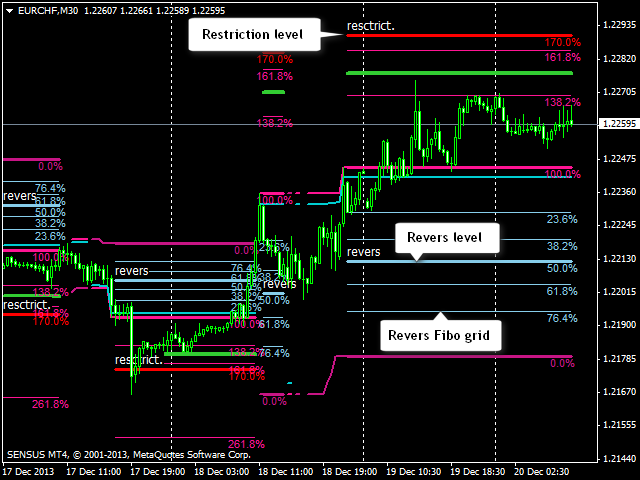 ReversLvl - the level, from which trading in that Fibo direction is stopped. The recommended value is 0.5. RestrictLvl - auxiliary level for sorting out the market's overbought/oversold states. pBand configures sensitivity of the Fibo grid calculation (in bars). The recommended value is 13. Buy signal appears when level 100 is above level 0. A pending order can be placed at any level. 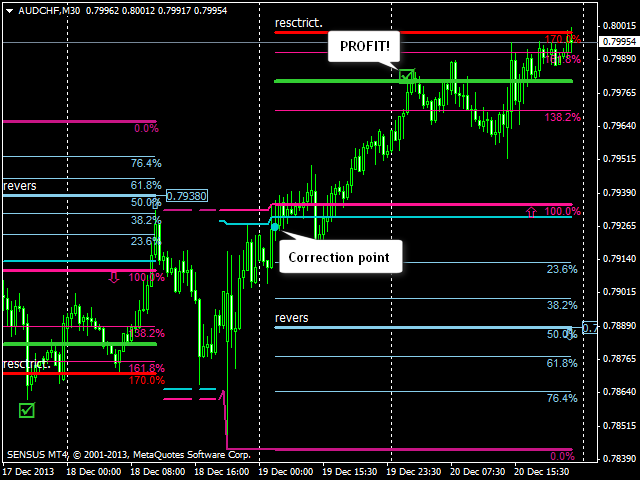 Take profit is set to ProfitLvl level. 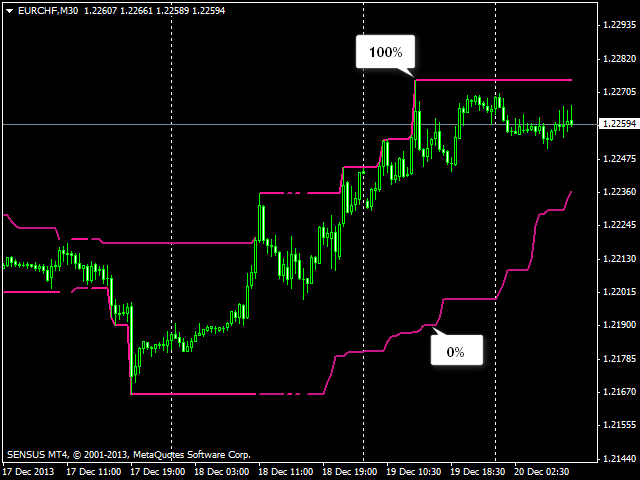 Stop loss is set to ReversLvl level. If the order is not activated, while the price has reached ReversLvl, the pending order is to be deleted. Exit the market after the objective is achieved. If you set a value for Correction parameter greater than 0.5 and 1 or greater for pBand parameter, then the indicator will calculate extremums. There is no response from the developer to queries. Very confusing product. Added check of the number of bars pBand. - Added audio signal when correction point appears. 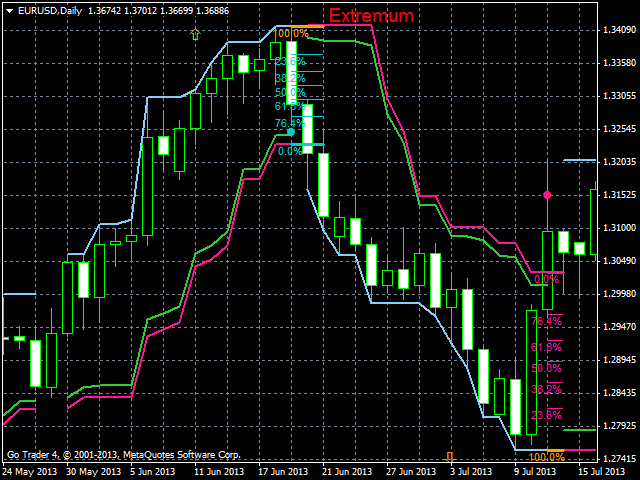 - Added bAlertCorrection parameter to enable/disable correction point alerts.